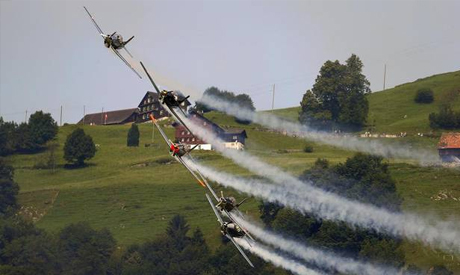 The Jordanian airforce will buy nine Pilatus training aircraft for fighter jet pilots, the Swiss company said Monday, without divulging the price tag on the deal. The deal for the nine PC-9 M two-seater planes also includes a simulator, training equipment and logistics support, Pilatus Aircraft said in a statement. The Swiss company said it had landed the deal amid strong international competition "after several years of hard negotiations, from which the PC-9 M finally emerged as the winner." "We are truly delighted to have a new customer and are confident that this purchase will encourage other air forces to consider our efficient Pilatus training aircraft for their own pilot training needs in the future," company chief Markus Bucher said in the statement. The company said the planes would be delivered to Jordan starting in January 2017, and would "form the future backbone for training the pilots tasked with flying the latest generation of military jets." Pilatus has already sold 260 of its PC-9 trainer aircraft to 15 air forces worldwide, including Saudi Arabia, Oman, Thailand and Australia, it said. In 2012, the company sold 75 of its less powerful PC-7 trainers to the Indian airforce for a reported $1.0 billion.